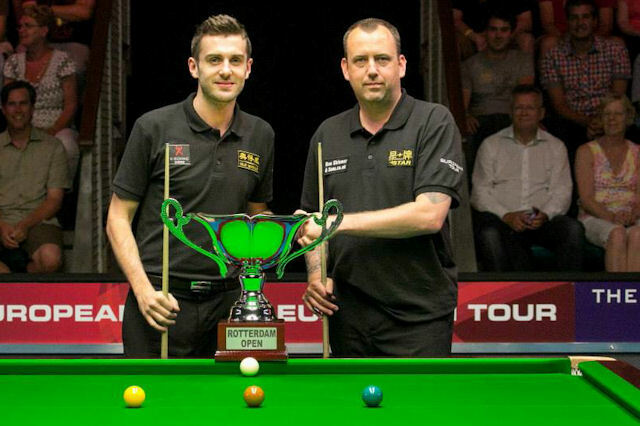 Mark Williams won his first title in over two years by beating Mark Selby 4-3 in the final of the Rotterdam Open. A winner of two World Championship titles and 18 ranking events, Williams is one of snooker’s all-time greats, but hadn’t won a tournament since the German Masters in February 2011, when he beat Selby in the final. So tonight’s victory marks a welcome return to form for the 38-year-old, who got the better of an exciting final to take the 25,000 Euro top prize. The European Tour event was the first professional tournament in the Netherlands for over 20 years. World number two Selby led a high-quality final 2-1 with a top break of 136 then Welshman Williams took the next two frames with 51 and 67. He had a chance for victory in frame six but missed a red to a top corner on 32 and Selby cleared with 77 to force the decider. But Williams regrouped to compile a run of 65 which proved the winning break. “Mark and Neil Robertson are the best two players in the world at the moment, so to beat one of them in a final is a great win for me,” said Williams. “When I arrived at this event I decided to go for everything and play as fast as I can. I was almost rushing at times but I wasn’t going to stop, especially not in the final. I’ve won the tournament so it must have worked. “I’m out of the top 16 now but I don’t care much because everyone starts in the same round of most events. I would like to be in the Masters so that’s the main reason to be in the top 16 now. The European Tour comprises eight events, with the top 24 on the final Order of Merit to qualify for the Grand Finals next March, to be joined by eight more players from the Asian Tour Order of Merit. The next event is the Bluebell Wood Open from August 15-17 in Doncaster.